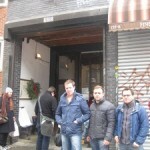 On a recent trip to New York we ended up staying in Brooklyn and felt the need to explore the Williamsburg area to see what there was to feed our stomach in the early morning hours. The first day my suggestion was outvoted and the majority’s choice produced a disastrous experience at a place that I refuse to review since reliving the memory will only cause me pain. Now after that experience we went to Egg on the second day and it was amazing, helping to suppress the painful memory of the morning before. I love the style that Egg has even from the outside you can tell that they do things differently. When you arrive at the front you have to keep your eyes peeled since the entrance is recessed and is hard to spot. 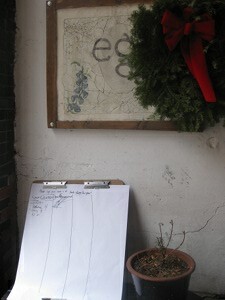 Right at the entrance you notice this presentation easel and marker. From the approach I was confused as to what it was, then I realized that it was to write your name and how many people in your group. It’s an interesting idea especially since the lineup can get long so at least it keeps it somewhat organized. Once you get in you notice an interesting style accented with high ceiling, aged white wall with an industrial look and a narrow long single room. 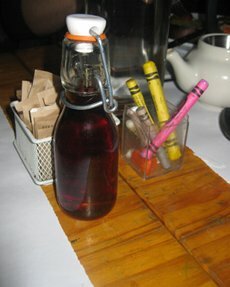 Some of the things I really enjoyed were the attention to detail; like crayons on your table for kids to draw with (or big kids like me), a small personal maple syrup jar (with real maple syrup), and an amazingly large French press for your coffee. 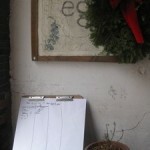 Now before I dive into the food, fork in hand, it should be noted that Egg proudly serves farm fresh product, including their milk, eggs, meats, from their own farm. This is a much appreciated aspect that helps a breakfast place stand out, because honestly you can taste the difference fresh ingredients make, and my philosophy is that if they care so much for the ingredients they use then they must care on the taste and presentation of the finished product that is given to their clients. Now time to share with you what we got to feast on. To begin with our coffee (sustainably grown) was brought to us in an enormous French press and although it did not have endless refills it was enough to satisfy 4 of us (the price was $2.25 per person). All the plates are under 10$ and the menu has some good fixed items that cover most of the classic brunch options with side options like meat, fruit and hash browns. The menu is not novel but in fact it’s a simple fold out with solid, well-priced options that cover pretty much anything you want. Describing some of the options aren’t that easy. You have your classic French Toast on one end and then you have biscuits and gravy, homemade granola, pancakes, and even grits on the other. 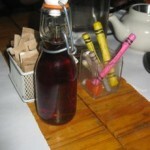 The menu has a classic American breakfast flavour to it with a kind of funky NYC twist. We had a bunch of varied and tasty options starting with the eggs Rothco, Organic grits, French Toast and the Grafton cheddar omelette, all of which were just great. 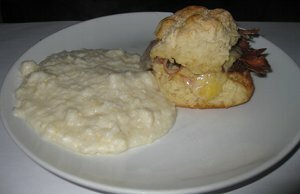 The Organic grits ($8.50) came with a biscuit stuffed with meat. 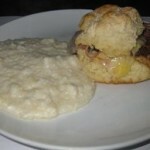 The biscuit was warm yet with the correct firmness so it was not too mushy nor too hard. Having never tasted grits before I did not know what to expect although once I tried it I knew I was going to like it. I was concerned it would be mushy like oatmeal or too firm and impossible to chew but it was neither and very tasty. 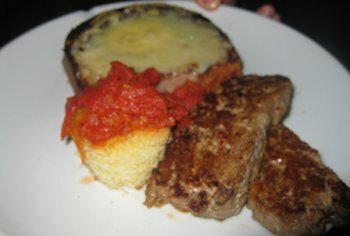 The eggs Rothco ($8.00) comes with easy cooked eggs served in in a brioche with Grafton cheddar, accompanied by a grilled tomato and meat or seasonal vegetables. 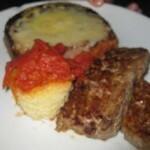 Although it may not look like a filling plate, it’s quite deceptive and the taste was a big hit. The tomato may seem like an odd choice but it was tasty and the brioche was great (and to be frank for $8 that’s pretty amazing in my books). 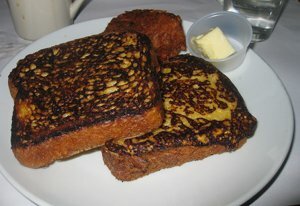 The French Toast ($8.00) came as 2 slices of “Amy’s Brioche” and Vermont maple syrup. 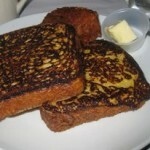 The 2 slices were nice and thick and the brioche bread was a much appreciated change – it was fluffy with some decent french toast “density” as I like to call it. That means tasty and filling while not being a brick. 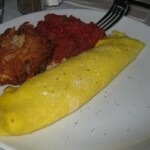 Lastly, the Grafton cheddar omelette ($8.50) is a 3 egg omelette with broiled tomato and hashbrowns. 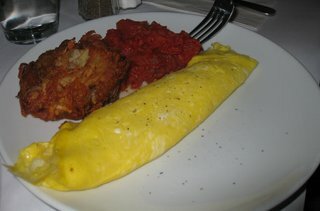 The omelette was very filling and the hashbrowns were a big hit. The service was very good and the way they used to get people seated was a nice touch. Our waitress came by frequently and was very helpful with all our questions since some of us were undecided on our final choice. Vegetarian options were available on the menu and many plates have it on the side so you can substitute it with something else. As for vegan options there are some sides like Caramelized grapefruit with mint ($3.00), Broiled organic tomatoe ($2.50), seasonal Fruit ($4.50). It seems like all these can qualify as vegan but please do ask because I did not ask and they likely do not have a segregated cooking area since not of it is labeled vegan. 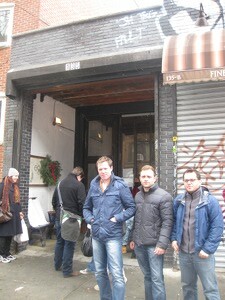 Egg is a definite must-go if you find yourself in NYC and especially Brooklyn. Although make sure to get there before 11:30 or else you may wait a while since it is not enormous, and do keep in mind it is cash only. Mon-Fri 7:00 A.M. to 3:00 P.M.
Sat-Sun 9:00 A.M. to 3:00 P.M.